Download Now for only $14.99 – Buy Here! In this series of tutorials, I will first look at how government bodies uses the services of external proposal evaluators to evaluate bids. While this process may change across different departments, it’s the one I’m most familiar with. 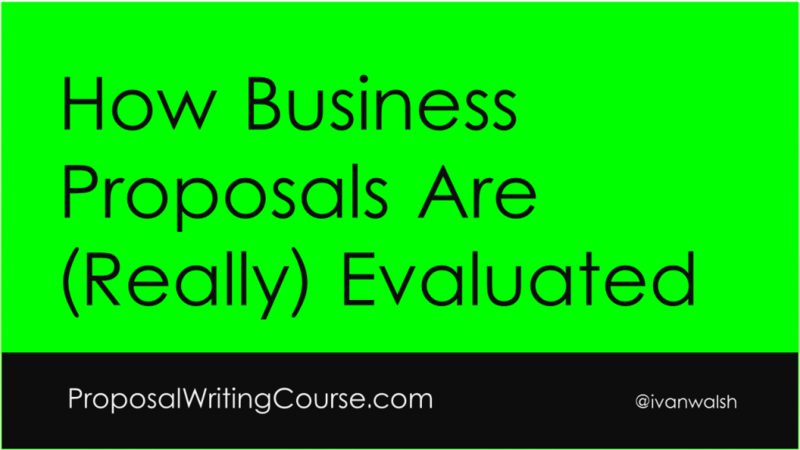 This article describes the rules and procedures for evaluating Request For Proposals. The evaluation shall be carried out by the Department in conjunction with [consultant 1] and [consultant 2]. Phase 1 – Assess the proposed solution against the requirements of the Request For Proposal. Phase 2- Concerns the financial assessment, i.e. which bid offers the best value for money. Identify lead evaluator for each tender. Review the Invitation to Tender (ITT) and Supporting Documentation including the Q&A responses. Identify any issues or risks in the ITT and Q&A documents. Develop a scoring scheme; agree the marking scheme, with specific references to the criteria stated in the Invitation to Tender and any risks or issues identified. Evaluators agree a threshold mark for each section. Evaluators agree a weighting system. Each evaluator attributes marks as per the marking scheme: note that the rules and guidelines described in this document should be applied in all aspects of the evaluation of bids. Consensus meeting is held at the end of the individual evaluations. It is assumed that any bids provided to the evaluating team by the government agency are valid bids (i.e. received on time and accepted as a bona-fide bid). In general, at least two independent evaluators are used on any bid. You need to appoint one lead evaluator and other evaluators to coordinate the assessment. In Phase 1, scores the tender submissions according to an agreed marking scheme. Participates in evaluation and consensus meetings. Attends meetings providing input as required. Apply the following rules, guidelines and procedures during the Phase 1 evaluation. The team to evaluate any bid is approved by the project leader. Any individuals involved in evaluating tenders must be consistently involved in reviewing all competing bids on a project. If someone becomes unavailable before they have fully reviewed all competing bids, their replacement must review all proposals including those already covered by the initial evaluator. The evaluation team must be objective and free from any conflict of interest. It is essential that all companies and evaluators are objective. If any company or individual has any financial or personal interest (e.g. competitor, business partner, shareholder, relative, employee etc) in any of the companies presenting tender bids, then they must make their interest known to the coordinating evaluator. This will be discussed with the client; if necessary, the evaluator may have to step aside and be replaced. All documentation that relates to the tender bids – and their evaluation – is subject to restricted access and should not shared wit any persons outside the evaluation team. Each evaluator is responsible for ensuring that the information provided to them is kept secure and confidential. During the assessment, there will be many reports and communications between the teams. Communication with prospective contractors (i.e. bidders) should occur in writing only and should be coordinated through the lead evaluator. Retain copies of all communication (including emails) with prospective contractors; submit these with the evaluation report. Communication with the government agency regarding project specifics and clarifications should also be in writing and preferably coordinated through the lead evaluator. Communication between evaluators regarding bid assessment should be avoided before consensus meetings. This ensures that evaluations are objective and independent. Communications regarding procedure or clarifications may take place if required. Use the Evaluators Report to communication the result of evaluations. It would be very strange if both evaluators awarded the same score to the same bid. In general, there is a difference of opinion, which is always a good sign. The question is how to discuss these scores and work towards consensus, i.e. a common score. Differences are likely to occur in individual scores in different sections of the bid; to explore this setup consensus meeting. Its objective is to address these points and, if possible, achieve an agreed evaluation score. If there are significant differences in the scores – which cannot be reconciled at a consensus meeting – you need to use an additional evaluation team (for instance, members of the government agency) to assess the bids. The final deliverable from a consensus meeting is a list of scored bids. Scores, rankings and recommendation(s) may be qualified with commentaries and notes. Note any anticipated risks associated with the bids based on the information available to the evaluation team. Individual evaluators’ sheets on each bid. Appendix with all written communications of any significance during the bid. Final evaluation report signed by the evaluators. Understanding of the Project; Quality of the Proposed Solution; Approach to Project Management; Proven; Completeness of the Proposal. Do you have any questions about how to evaluate a Request For Proposal? Please share them below and we can discuss it together. Why The Table of Contents Is The Heart of Your Business Proposal?